A neonatal nurse practitioner (NNP) is a highly skilled, highly educated advanced practice registered nurse (APRN) who is responsible for providing specialized care to newborn infants who are experiencing a broad range of acuity and states of health, including prematurity, low birth weight, infections, genetic disorders, congenital heart abnormalities, and respiratory problems. Neonatal nurse practitioners should also be well versed in the diagnoses of other health conditions. NNPs care for neonates who require constant attention and frequently act as primary caregivers to premature or ill newborn infants. Neonatal nurse practitioners can often be found working in intensive care units, delivery rooms, emergency rooms, and specialty clinics. In spite of the fact that neonatal nurse practitioners work under the instruction of a neonatologist physician or neonatal fellow, NNPs assume absolute responsibility for their patients' health, employing judgment when required to evaluate, consider, diagnose, and commence medical procedures. Prospective neonatal nurse practitioners who wish to care for newborn infants need to have exceptional dexterity, vision, agility and should be highly observant with excellent hearing to ensure the well-being of infants under their care. Additionally, individuals seeking to become an NNP should exhibit a kind of empathetic understanding for not only their patients but their parents and family members as well. Prospective NNPs should be intensely interested in newborn babies and should have a solid understanding of both the physiological and psychological needs of the infant. Lastly, individuals interested in becoming a neonatal nurse practitioner should without a doubt possess both the competence to work in a highly technical field and the ability to work efficiently within a multidisciplinary team of medical clinicians. What Are the Educational Requirements for a Neonatal Nurse Practitioner? Those interested in entering this distinguished and highly regarded medical career must first meet the entry-level educational requirements. Prospective NNPs must enroll in a four-year university to obtain their Bachelor's of Science in Nursing (BSN) degree. After an individual has achieved their BSN, they can then sit for the NCLEX-RN (Nursing Council Licensure Examination). As soon as they have successfully passed the NCLEX-RN examination, the next step is to apply to the state's licensing agency to become a fully licensed, traditional registered nurse (RN). The final educational hurdle that a person seeking to become an NNP is to either earn a post-grad Master of Science in Nursing (MSN) degree with a concentration in neonatology, or to enroll in and complete a two-year Advanced Practice Neonatal Nursing (APNN) program. Completing one of these two educational programs is a prerequisite for a licensure as a nurse practitioner (NP) or clinical nurse specialist (CNS). Both of these routes are acceptable for national certification and advanced practice licensure or recognition through all state Boards of Nursing. Advanced practice university nursing programs typically will have its core curriculum in disciplines including neonatal physiology, embryology, advanced neonatal assessment, pharmacotherapeutics, and neonatal pharmacology. Graduate level university programs are designed and formulated to meet all requirements for national certification. All graduate level degree programs will consist of both didactic studies as well as clinical preceptorships. After an individual completes their graduate or post-graduate education, they are then eligible for national certification through the National Certification Corporation, which recognizes NNPs. The majority of states require national certification for NNP licensure, although not all states recognize the same national specializations. It is important to check with your state's board of nursing beforehand to determine which NNP specializations are recognized. Read more about neonatal nurse NP programs. Where Do Neonatal Nurse Practitioners Work? The job description of neonatal nurse practitioners includes a wide variety of tasks; however, their primary focus is on the highly specialized care of newborn infants. Neonatal nurse practitioner careers require the utmost diligence and high levels of teamwork. NNPs work in close collaboration with not only the parents and families of their patients, but also with neonatologists and other specialist clinicians to actualize the most favorable results for neonates. The highly specialized and in-depth training that NNPs must go through allows them to administer individualized assistance to infants from the moment they are delivered, whether they are born healthy or in critical condition. Furthermore, NNPs possess what is called ‘prescriptive authority' and are permitted (in most states) to prescribe medications as needed to their infant patients. What Are the Roles and Duties of a Neonatal Nurse Practitioner? Level I NICUs (Basic Newborn Care): In these facilities, NNPs help to maintain the stability of newborn infants at 35 to 37 weeks' gestation who are physiologically sound. They contribute to stabilizing infants who are born at less than 35 weeks' gestational age or sick until they can be transferred to a healthcare facility that can provide an acceptable level of neonatal care. Level II NICUs (Intermediate Neonatal Care): This level is designed for newborns who are less critically ill but who may require breathing and/or feeding support, or a particular medication. Level III NICUs (Subspecialty Newborn Care): NNPs employed at this particular level of the NICU are in charge of caring for newborn infants who've been born at less than 32 weeks' gestation, or those suffering from severe afflictions at any gestational age. NNPs working in level III NICUs offer their patients access to a wide variety of pediatric sub specialties, respiratory support systems, and advanced imaging technologies. Level IV NICUs (Regional NICU; Highest Level of Neonatal Care): NNPs working in Level IV NICUs provide care for infants who are born as young as 22 to 24 weeks' gestational age. NNPs working in these settings will provide mechanical ventilation, including high-frequency ventilation, and a wide range of advanced surgeries including "open-heart" surgeries which are essential in correcting congenital heart malformations. According to the U.S. Bureau of Labor Statistics, the nursing profession is predicted to increase by 22 percent by 2018. Recently, in the United States and Canada, there has been a vast shortage of nurses in specialized medical areas. According to the National Association of Neonatal Nurses and the U.S. Bureau of Labor Statistics, neonatal nurse practitioners (NNPs) are receiving an approximate median annual salary of $105,325. NNPs employed in part-time positions earned an average of $45.31 per hour. 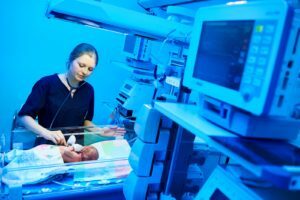 As is the case with all careers in the nursing field, the need for neonatal nurse practitioners (NNPs) is anticipated to increase considerably in the coming decade. Typically, neonatal nurse practitioners with advanced education, training, credentials, and experience will be the most desirable candidates to potential employers. Interested in learning more about NP salaries and other avenues of APRN careers?